To begin with, I love dogs and working with dogs. 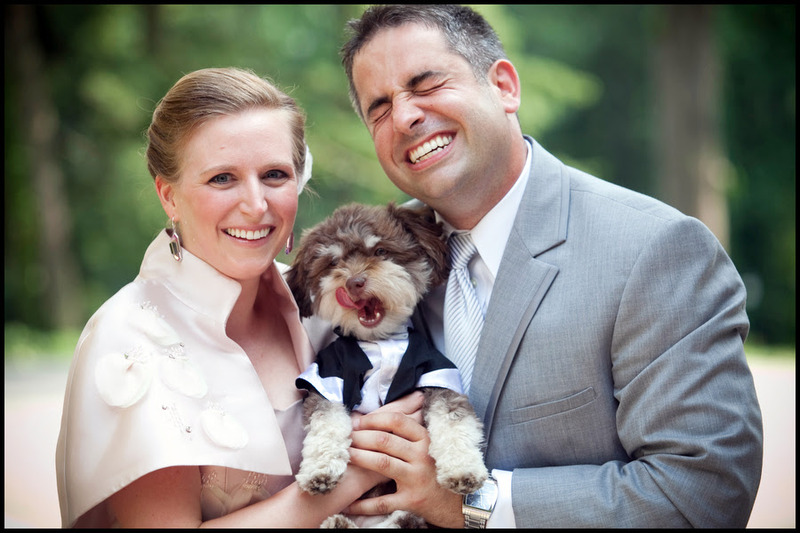 Whenever there's a dog at a wedding, I get excited because they always add fun and comical energy to the photos. On this particular day, there were two adorable English Bulldogs, and I wanted to include them into the wedding photography somehow. However, it wasn't as easy as I had hoped. Both were bound with pup energy and kept playfully biting at the camera as if it were a toy! After much effort and wedding-day excitement, the pups finally crashed. That's when I saw the shot: a ring shot. At first, I started with the rings in front because I didn't want to wake the pup. After playing around with a few different ring positions, I heard loud snoring. That's when I gently placed the rings on the dog and waited to see if he would wake. 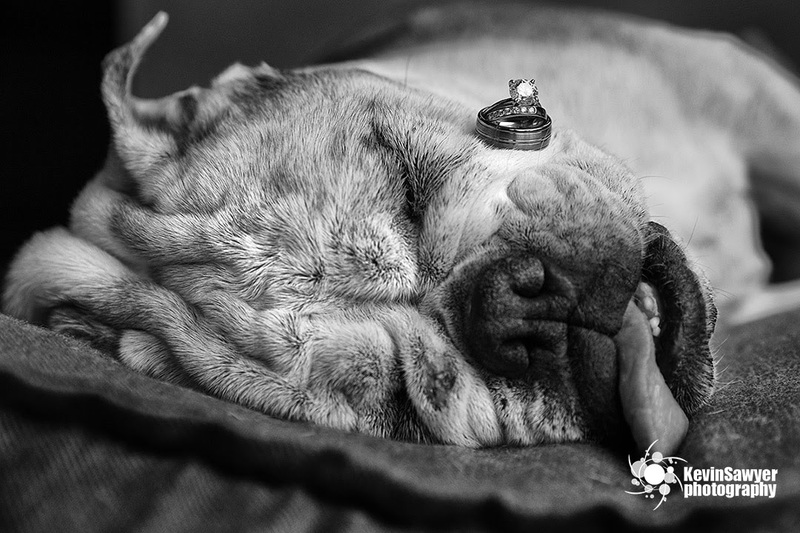 To my luck, he was out cold, giving me the ability to position the rings exactly how I liked on his cheek and allowing me to create a fun, pup-worthy ring shot. 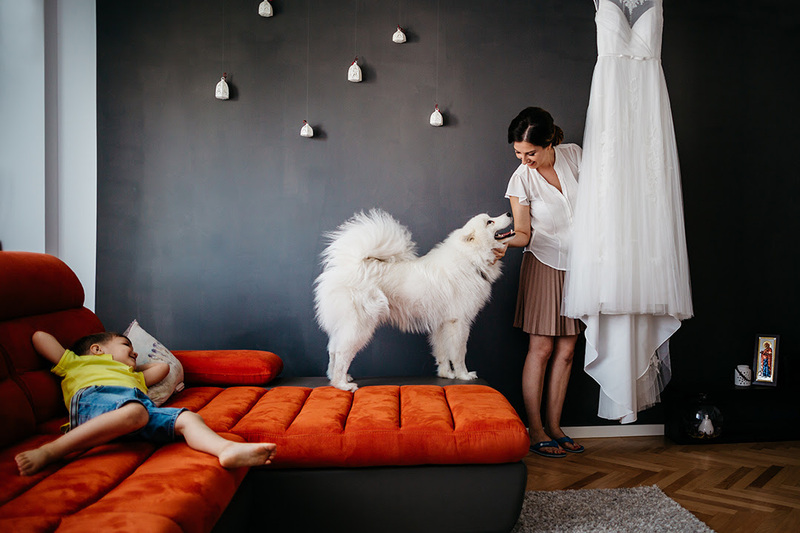 A very relaxed Romanian wedding where the couple’s beloved Samoyed dog was at the bride preparation and was always with us. It was fun to have it around and to include it in the wedding pictures. I always like to have kids or animals at the weddings, it’s more fun with them. The dog belongs to the family. Seizing the emotions of this moment makes everything magical. For this image, we traveled all the way from Germany to the beautiful islands of Sal. It was an engagement session and I told the couple to just sit down and relax. I waited and waited until something cool happened. And finally - a dog turned up. 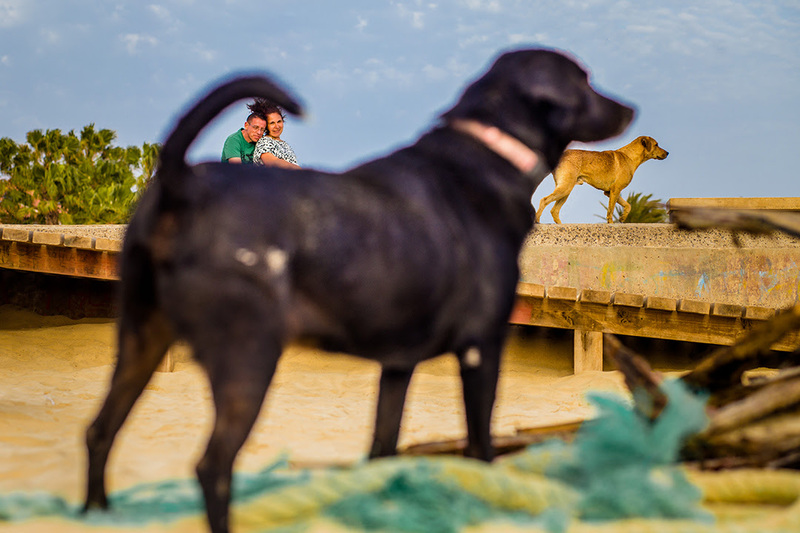 After a one or two "normal" shots with the dog in the foreground, I had the crazy idea to frame the couple in the dog tail. I pressed the shutter a few times but only with this one image did I achieve the perfect framing. Just a few seconds later the dog ran away and we never saw it again. 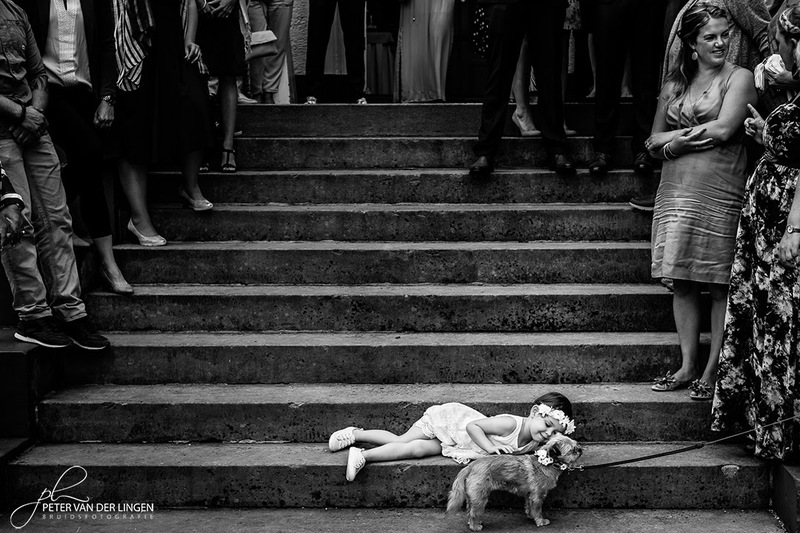 While all the guests were waiting for the arrival of the bride and groom, I saw this little bridegirl playing with the dog on the stairs of the Castle. 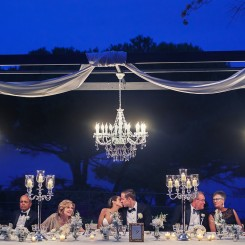 This was one of the first surprises that Ana, the bride, prepared for her wedding. When the ceremony finished, Dani found out his dog was hidden inside of a big box. 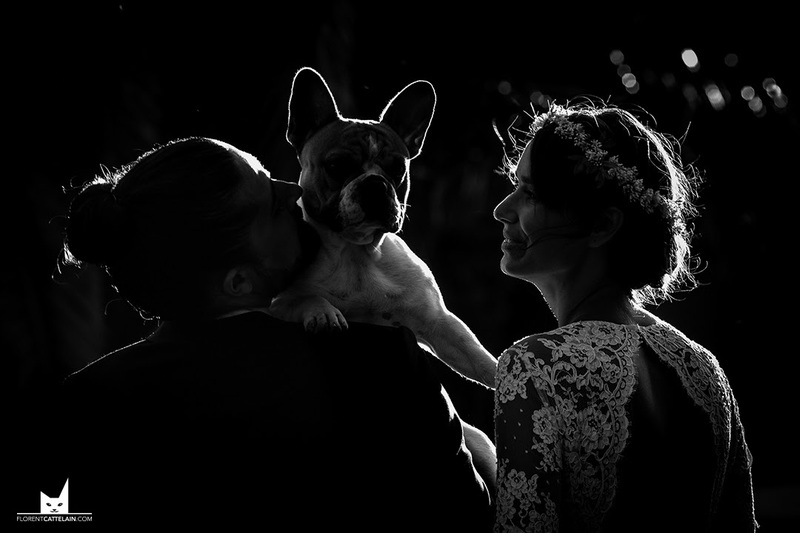 It was amazing to capture all the emotions of the groom when the dog appeared. 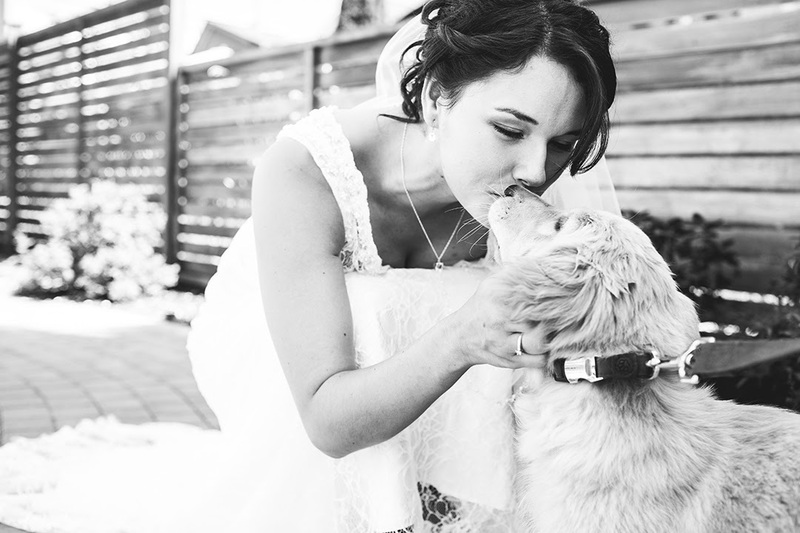 Reluctant to leave her new baby golden retriever with a family friend who was dog sitting for the day, our soft-hearted bride, Ellie gives her sweet little puppy a kiss goodbye as she heads to her wedding ceremony. I was chatting to a guest on my break, when the groom's old family dog came over and sat down next to me. 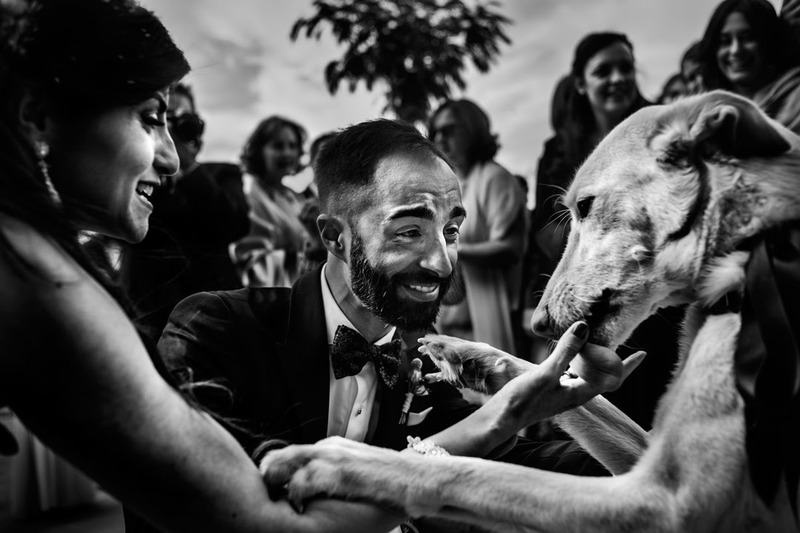 He was such a warm and friendly dog, and I wanted to capture those loving eyes and the perspective the groom and his family would be used to seeing him at. Tom and Linda were getting married at a fancy venue in Baltimore called the Evergreen House. The place did not allow pets but the couple really wanted a photo with their beloved dog. They had even bought him a little doggie tuxedo! We arranged for a friend to drive the dog to the front of the venue. He jumped out and we got a couple of quick portraits before anyone on staff knew what had happened. What can I say, sometimes you have to break the rules. Usually, the getting ready of the bride is for me one of the best parts of the wedding. This time it happened differently. The bride, Noelia, had two small dogs at home, one was adorable, she let me pet him and we became friends! The other is the dog that is portrayed in the photo. 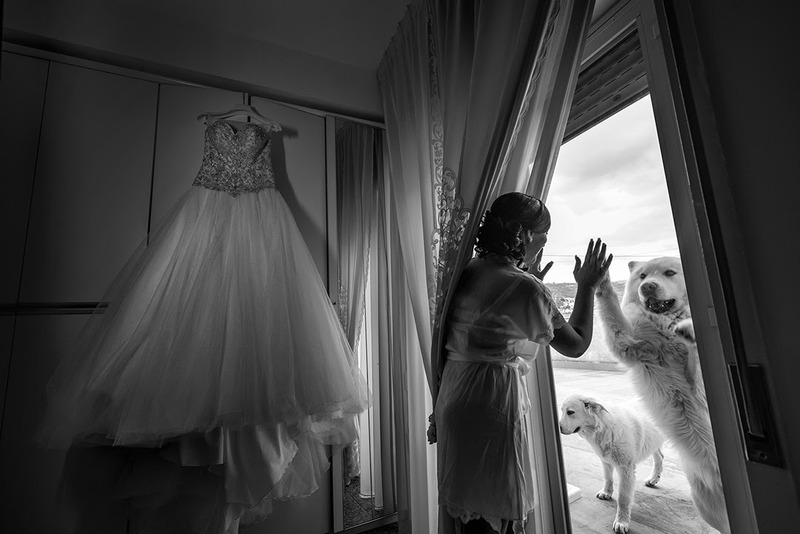 Every time I came close to the bride to make a portrait it barked at me! 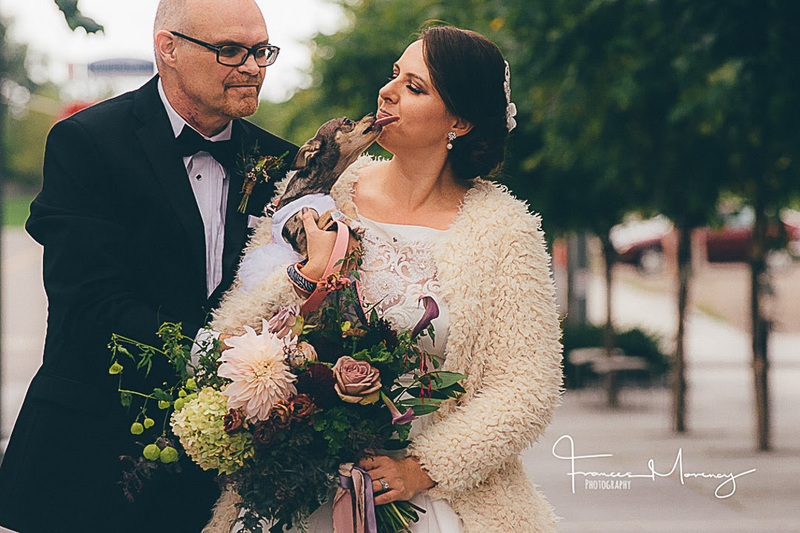 The dog thought the bride was his girlfriend! As they made up the bride, she climbed on her legs and stood guard. The dog's eyes told me, if you get in I'll bite you! 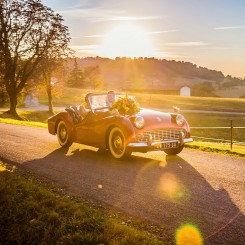 This photo was taken at an engagement session for the upcoming wedding of the bride and groom in San Francisco Bay Area. 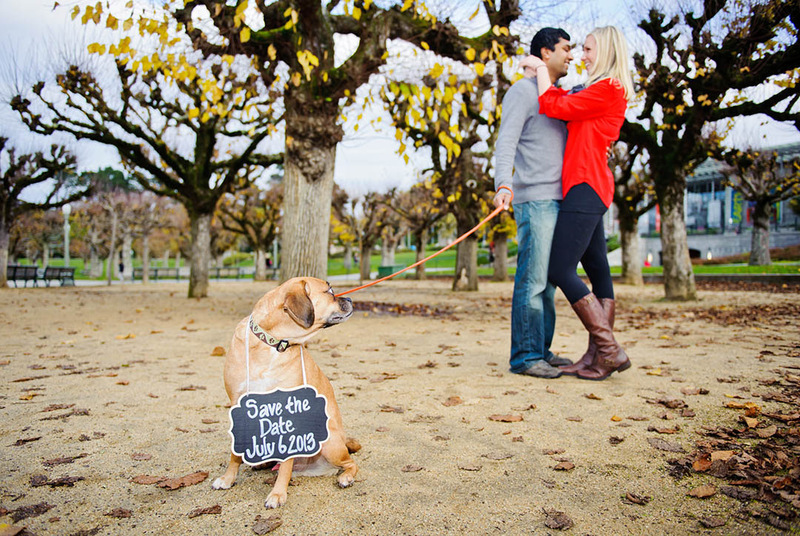 They have a small dog and they had the dog hold the "save the date" sign for their wedding. What a cute idea. Last photo of the day downtown Toronto near the Distillery District, and the bride really wanted a photo with the new pup. I expected this to happen as soon as she picked her up, and I was ready. 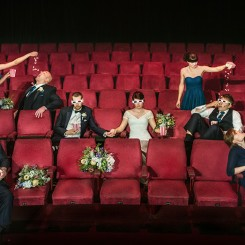 We met Joanna and Daniel two days before their wedding! This is our record! 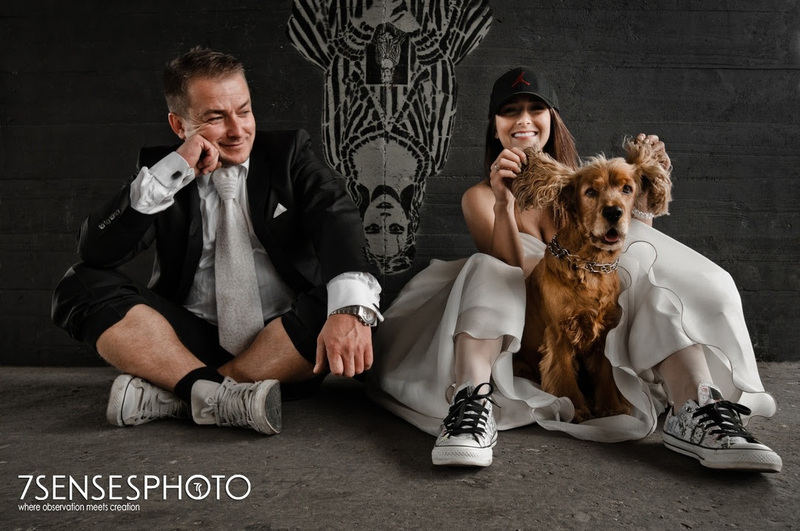 :) Their proposals for their post-wedding photo session was: hip-hop, dog and fun - that is what is important to them in daily life. Their dog turned out to be a great model which you can see in the photo. I had always liked this breed of dog and dreamt about a wedding photo shooting with a shepherd in the mountains. My dream came true in January 2014, in the most beautiful mountains in Poland- Tatra Mountains. We were lucky because the breeder and the vet from whom we rented the dogs had a lot of them, two litters of puppies and some grown dogs. Six three months old puppies and their mother took part in the shoot. Our couple Betty and Daniel were delighted. As for dogs, they were happy too because it was their first time outside. We carried them out in our arms, which was an amazing experience for us. 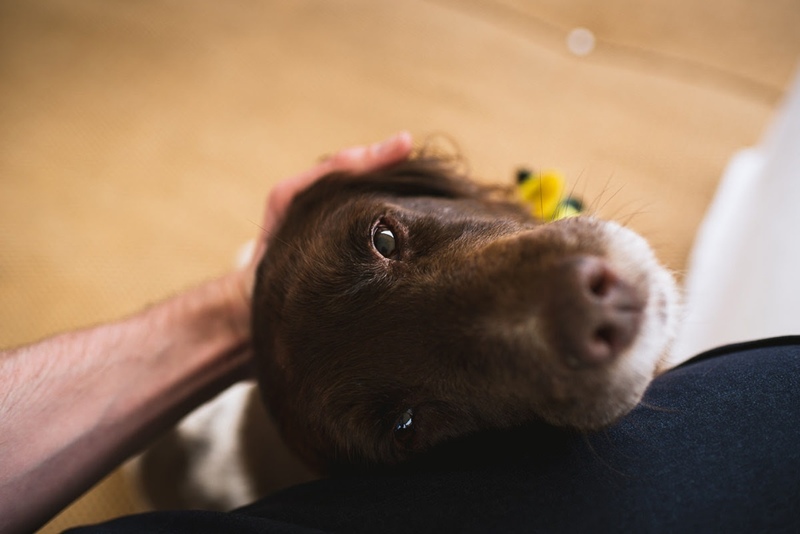 The world would undoubtedly be a much sadder place without our four-legged, fluffy friends. Having the presence of our clients´ beloved pets has proved so far one of the most effective ice-breaking, session-stress releasing factors. 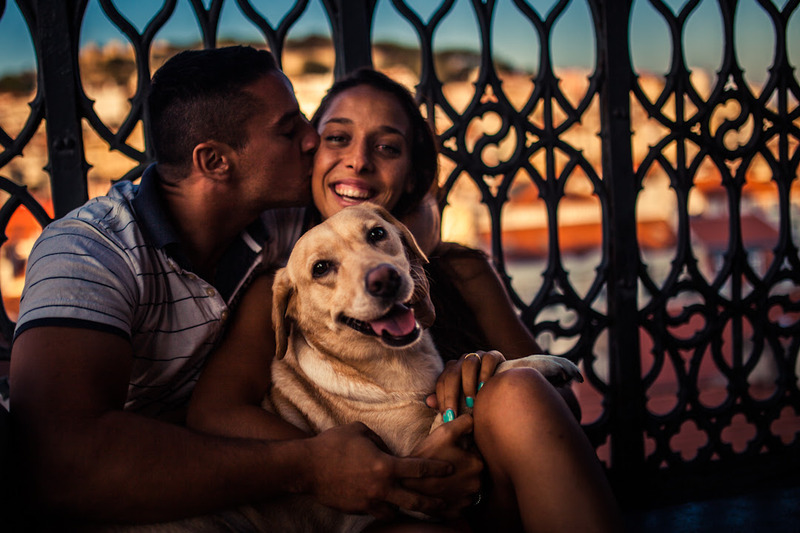 Oftentimes, when a couple feels intimidated or embarrassed in front of the camera, a dog´s presence during the session makes the couple transfer their focus on their pets. 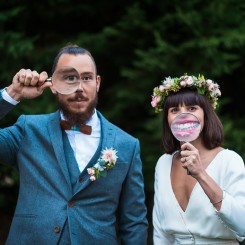 The couple feels less inhibited and genuine emotions open up. Just as Josh Billings´ famous quote goes: “A dog is the only thing on earth that loves you more than he loves himself”, so including your beloved pet on a photo-shoot is a wonderful honour paid to those faithful creatures. The couple was able to give a big hug to their baby "Stitch" during the cocktail, I was able to capture the moment of complicity. 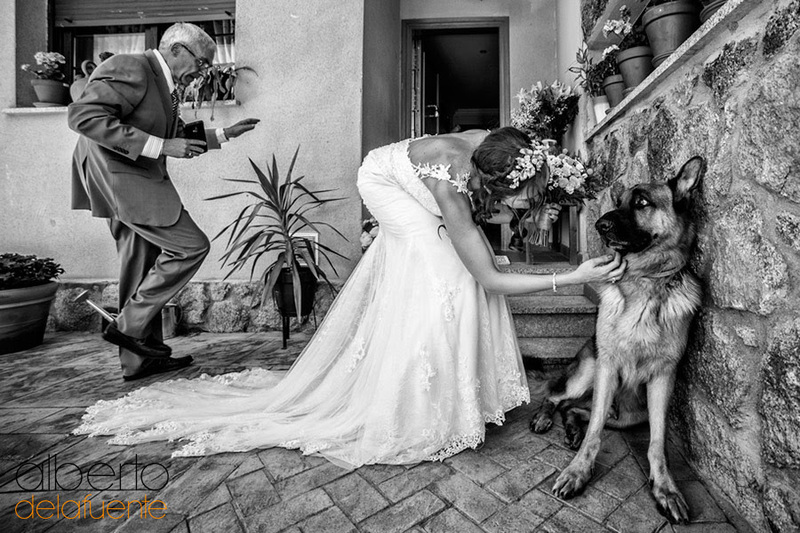 Capture the photo at the right moment when the father walked and almost stepped on the dress of the bride and it seems that the dog is watching the disaster that can happen. 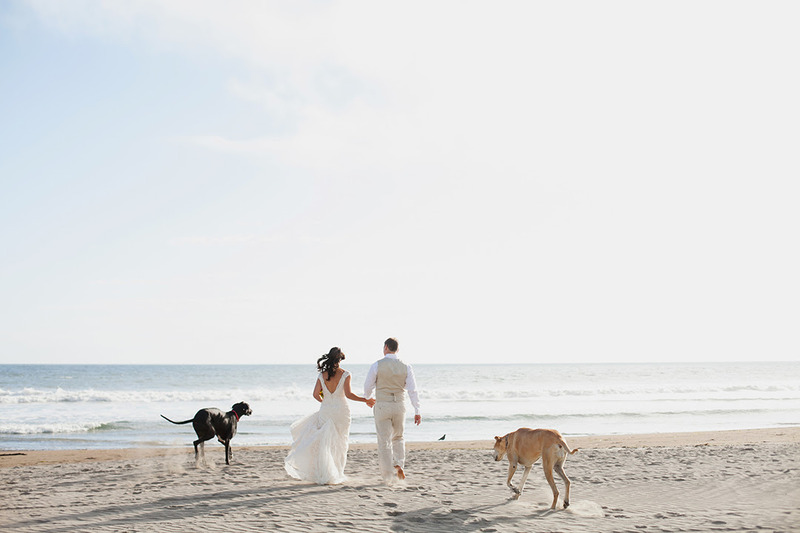 Desiree and Jeff had an intimate wedding in the backyard of a beach house they rented, and the thing they were most excited about was going for a walk with their dogs down to the beach afterwards. In this moment they were walking out towards the water and I just loved how their dogs ran alongside them, falling into place for the perfect photo. I loved capturing the simplicity of this moment, the excitement of their pups as they ran on the beach, and the love between the four of them. The photos are gorgeous! 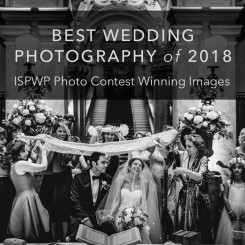 Congratulations to the photographers!